I don't hear today's entry talked about very often, which is somewhat surprising, I figured it would be one of those love it or hate it things that always gets brought up for debate. Admittedly, I haven't watched the 1994 Royal Rumble in quite awhile and don't remember much from the match itself, but I distinctly remember the ending and really dug it. 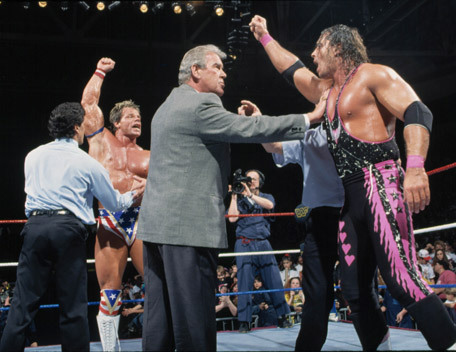 Both Bret Hart and Lex Luger went over the top rope at the same time and the referees were left with no other choice but to declare them the co-winners of the 1994 Royal Rumble. It was different and for this 10-year-old fan, that made it really cool. I was definitely #TeamLuger in those days, I had a jean jacket with the American flag on the back of it, so Lex and I had similar tastes, which made him my hero. Of course, Bret went on to tear the house down with Owen and regain the WWE Title later in the evening at WrestleMania 10, while Lex went on to... uh... hmmm... feud with Tatanka? So as you can see, I don't always put my money on the right horse. But what did you think of the finish to the 94 Rumble? Since I never hear about it and it's only been reattempted once with Batista and Cena in 2005, would you like to see another controversial Rumble finish in the future? Does it spice things up or is it a cheap ploy for attention? Even at the time (I was 15) I remember thinking this was some kind of masterstroke. It was only the second year for the Rumble winner to get a guaranteed title shot at WrestleMania, so one could argue they maybe could have kept this arrow in the quiver a bit longer. And I often wonder how much of WMX was booked at the time they settled on the Rumble finish. Plus, this one gets bonus points for me with the show ending incorporating the old-school WrestleMania song I inexplicably love so much.